Capitalism is cruel and unforgiving. It follows, then, that a game that, oddly enough, exists as both a parody and a celebration of capitalism should also be cruel and unforgiving. For better or worse, that’s exactly what Penny-Punching Princess is. At first glance, this looks like a fairly typical 2D action RPG, laced with Nipping Ichi Software’s usual brand of oddball humour. There’s a nameless princess on a quest for revenge following the death of her father, a medley of different monsters to fight, and plenty of dungeons full of traps and treasure to wade through. Zenigami’s power manifests in… a calculator. This isn’t just any calculator, though; with it, the princess can bribe monsters and traps (somehow), turning them to her side or at least convincing them to leave the fray. Each enemy and trap has a certain cost attached to it, and if you can meet that cost—or exceed it, though there’s no benefit for doing so—you’ll be successful. Related reading: The Longest Five Minutes, another quirky RPG from Nippon Ichi Software released earlier this year, puts a creative spin on the old “amnesiac hero” trope. Read our review to see why it’s worth your time. A successfully bribed monster will simply disappear from the battlefield, though you’re left with a couple of stocks of a related special ability. The Heart Man monster, for instance, is fairly weak and poses little threat, but bribing one gives you a healing spell that you can use a couple of times. Bribed traps don’t disappear; rather, they deactivate, and you gain the ability to use them to attack enemies a couple of times. You can’t simply bribe things willy-nilly, though. The calculator takes time to recharge after each use, and you can only keep one special ability—whether it’s a monster ability or a trap—at a time; if you have any remaining uses when you bribe something else, they’ll be lost. Then, of course, there’s the financial aspect: you can’t bribe if you don’t have money. 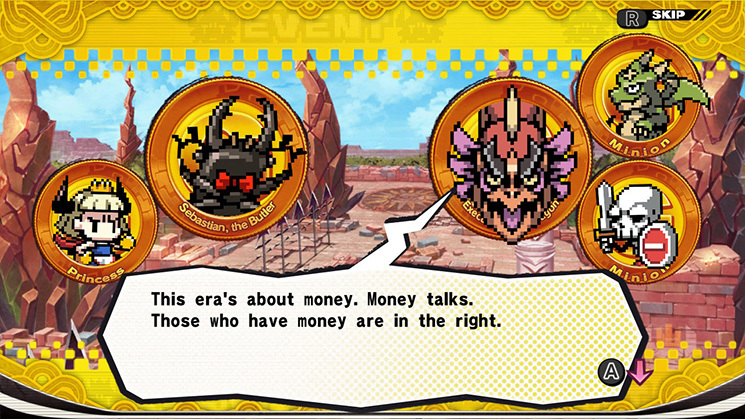 Tougher monsters and deadlier traps cost more, but there’s a lot more benefit to bribing them, in terms of both the abilities that you get and the removal of the most dangerous threats from battle. You’ll find a bit of money in chests and dropped from slain foes, but your main source of revenue comes from shaking down enemies—literally. Do enough damage to an enemy, and it will “break”, leaving them briefly stunned; during this time, spinning the right analog stick around will make said foe drop a whole lot of coins. That’s really your main source of income, and in longer battles with numerous waves of enemies, it’s crucial to being able to bribe your way out of getting slaughtered. You could try to simply attack your enemies in the old-fashioned way, but that’s almost guaranteed failure. 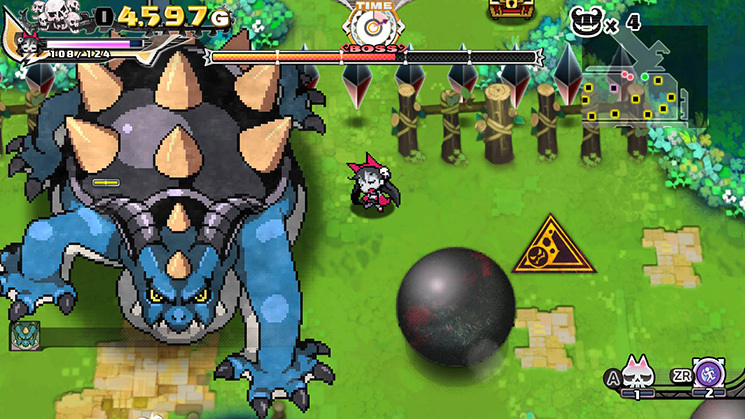 If you want to get through Penny-Punching Princess‘ enemy hordes and fiendish traps, you need to make full use of your capitalist powers: shaking down enemies, and making quick decisions about how best to bribe your way through each encounter. Making good use of traps is vital, and each boss—whom you can’t bribe directly—is designed around turning its minions and traps against it. It’s an inventive combat system, to say the least. It’s also chaotic and messy, but not in a good way; rather, there’s just too much going on, with excessive micromanagement in the midst of very busy and frantic battles. Picking targets for bribes happens in real time, but you have to use the D-pad to cycle through them, forcing you to stop moving (and make yourself vulnerable) while you do it. Enemies tend to cluster up in big groups, so it’s often hard to see what you’re actually targeting. A button shortcut lets you automatically set the bribe to the price of the targeted enemy, avoiding the need for awkwardly typing digits into the calculator manually, but it’s very unresponsive. I often found myself accidentally just typing in random numbers rather than bribing an enemy, simply because I was pressing buttons faster than the game allowed for. In the midst of all that, you’ve got enemies that usually attack in large groups and hit hard, and a very ineffectual dodge roll as your only defensive tool. The 2D overhead camera and visual chaos of combat makes it tricky to get a good idea of attack ranges and the like, so even learning to outmaneuver enemies takes far longer than it would in most other action RPGs. 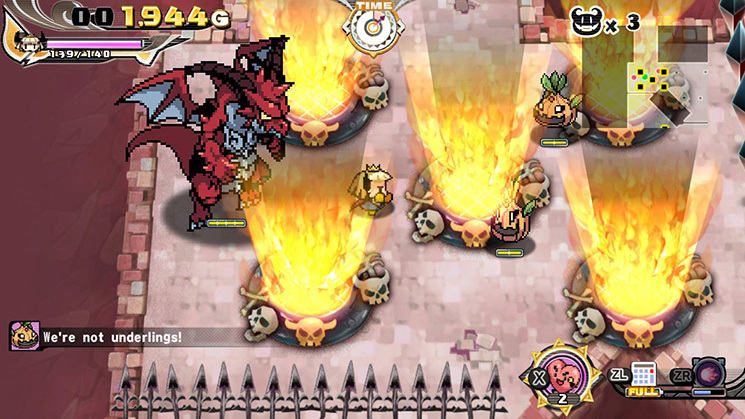 When everything comes together nicely—typically, when you’re replaying an earlier level, with the ability to plan ahead and without any surprises—combat in Penny-Punching Princess can be a lot of fun. But, sadly, too many things get in the way of the game’s good ideas too often. The story, meanwhile, is disappointing in its shallowness. It’s very fun and irreverent, with lots of quirky characters and silly jokes about money and capitalism, but it never really amounts to more than that. Aside from a poorly-developed arc about the princess becoming a victim of her own power, Penny-Punching Princess to just make light-hearted jokes about the problems of capitalism. It’s a comical satire that’s ultimately toothless, despite being perfectly set up for a scathing critique. I’ll admit that it is very funny, as Nippon Ichi games tend to be, and it inspired more than a few chuckles from me. The wacky characters and bizarre scenarios are entertaining, and the bright, colourful 2D artwork that pervades the game gives it a sense of joyful charm. If you don’t think about it too much, this can be a very enjoyable game. But Penny-Punching Princess shouldn’t need that sort of qualifier. A game that seems designed for a scathing critique of the horrors of capitalism is instead content with a toothless satire that doesn’t really say much at all. It’s still a creative, oddly funny game, but it feels like it could—and should—have been so much more than that. 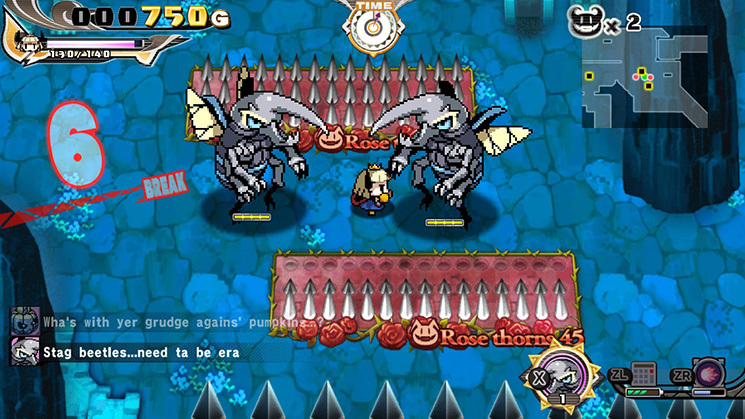 Penny-Punching Princess is developed by Nippon Ichi Software and published by NIS America. It launches on 30 March (Europe), 3 April (USA), and 13 April (ANZ) for Nintendo Switch and PlayStation Vita.